Thank you for this case comment. 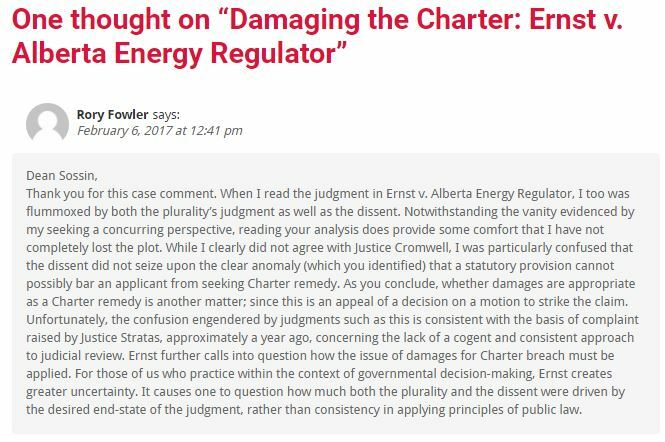 When I read the judgment in Ernst v. Alberta Energy Regulator, I too was flummoxed by both the plurality’s judgment as well as the dissent. Notwithstanding the vanity evidenced by my seeking a concurring perspective, reading your analysis does provide some comfort that I have not completely lost the plot. While I clearly did not agree with Justice Cromwell, I was particularly confused that the dissent did not seize upon the clear anomaly (which you identified) that a statutory provision cannot possibly bar an applicant from seeking Charter remedy. As you conclude, whether damages are appropriate as a Charter remedy is another matter; since this is an appeal of a decision on a motion to strike the claim. Unfortunately, the confusion engendered by judgments such as this is consistent with the basis of complaint raised by Justice Stratas, approximately a year ago, concerning the lack of a cogent and consistent approach to judicial review. Ernst further calls into question how the issue of damages for Charter breach must be applied. For those of us who practice within the context of governmental decision-making, Ernst creates greater uncertainty. It causes one to question how much both the plurality and the dissent were driven by the desired end-state of the judgment, rather than consistency in applying principles of public law. The case arises in the context of a property owner, Jessica Ernst (Ernst), who is seeking various remedies against private and public parties she believes responsible for harm to her property as a result of fracking activities. 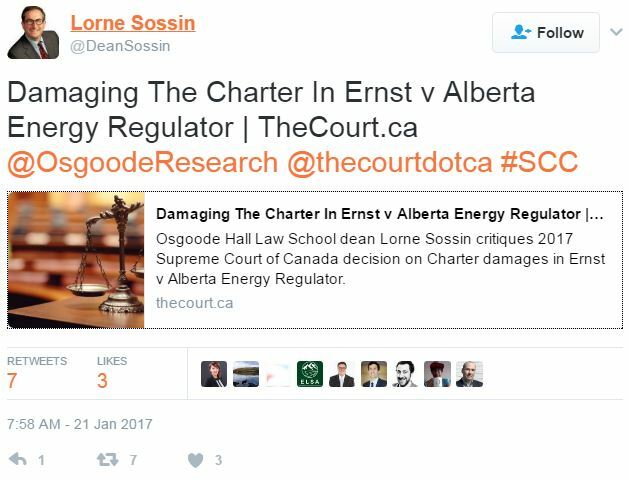 One of the defendants in her claim was the Alberta Energy Regulator (the “Board”), a statutory, quasi-independent energy regulator. Among other grounds for relief, Ernst alleged she was “punished” by the Board for publicly criticizing the Board and prevented by the Board from speaking out for a period of 16 months. Ernst claimed that her s.2(a) Charter right to freedom of expression was breached, and that Charter damages should be available to remedy that breach. As this case arises from a motion to strike her claim based on pleadings, all the facts alleged by Ernst must be accepted by the Court as true. A provision (s.43) of the Energy Resources Conservation Act—the statute that governs the Board—immunizes the Board from civil claims for actions it takes pursuant to its statutory authority. 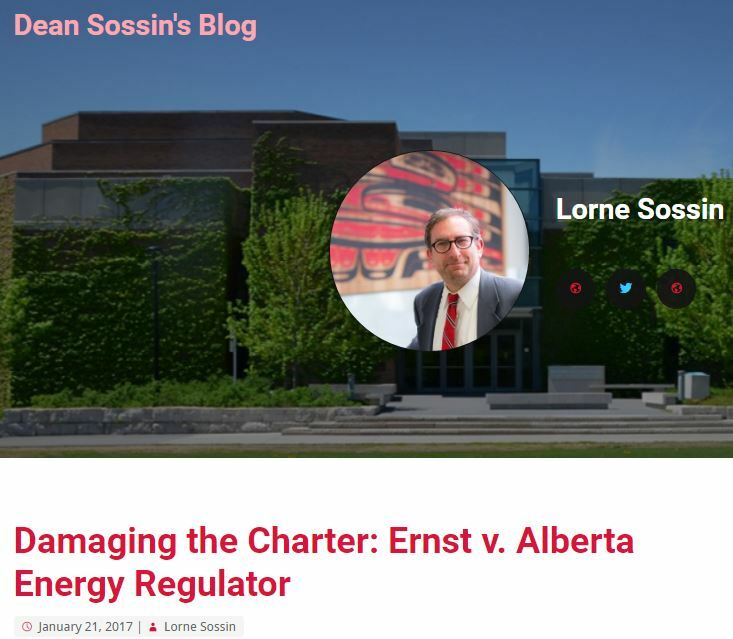 Both the Alberta Court of Queen’s Bench and the Court of Appeal found that the immunity clause on its face bars Ernst’s claim for Charter damages and concluded therefore that her claim against the Board should be struck out. On appeal to the Supreme Court, for the first time, she added to her claim a challenge to the constitutional validity of s. 43. The premise of the majority is that a Charter damages claim is akin to other civil claims for damages, and therefore precluded by the statutory bar. In reaching this conclusion, the majority relies on cases involving the high bar for negligence claims against public regulators—Cromwell J. observes, “While, as noted, Charter damages are an autonomous remedy, and every state actor has an obligation to be Charter-compliant, the same policy considerations as are present in the law of negligence nonetheless weigh heavily here…” (para. 43). The second point in this passage simply does not follow from the first. 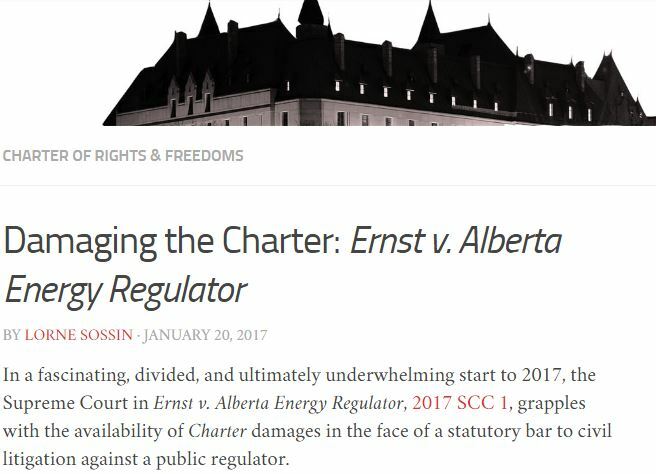 If Charter damages represent an autonomous remedy, and if every state actor has an obligation to be Charter-compliant, then the case law relating to negligence against state agencies sheds little if any light on the issue (just as the majority of the Court, in Henry v. British Columbia (Attorney General), 2015 SCC 24, held that the tort of malicious prosecution did not shed light on the test appropriate for Charter damages claims against Crown prosecutors). The search for remedies that are “just and appropriate” under s.24 of the Charter is fundamentally distinct from the search for a duty of care and breach under the common law tort of negligence. In deciding whether a claim for Charter damages should be struck out on the basis of a statutory immunity clause, the court must first determine whether it is plain and obvious that Charter damages could not be an appropriate and just remedy in the circumstances of the plaintiff’s claim. By suggesting that the merits of the Charter damages have to be assessed before considering the scope of the statutory immunity clause, the dissenting Justices, like the majority, seem to put the statutory cart before the constitutional horse. It is entirely possible that Charter damages are not warranted in the circumstances of this case (though it is uncertain on what grounds the Court could reach such a determination while also accepting all the facts as pleaded by the claimant as true), but that analysis has little to do with whether a statutory bar can preclude a s.24 Charter remedy. The issue in the appeal to the Supreme Court is on the scope of the statutory immunity clause, not the strength of the claim to Charter damages. In my view, the answer to the question regarding the statutory immunity clause raised in this case is far simpler than the approach taken by the majority or dissenting Justices. An immunity clause can preclude only those claims that a legislature has the constitutional authority to bar—that includes civil claims for damages, but it cannot bar Charter claims (including Charter claims where one of the remedies sought is Charter damages). On this reading, the Court could and should have interpreted the statutory bar as inapplicable to this claim to the extent a breach of the Charter is properly pleaded. Further, to Justice Abella’s objection in her concurring reasons, the Alberta Government would not need to have received formal notice of the claim, since the validity of the statutory immunity clause does not arise as a live issue if it is interpreted as inapplicable to Charter claims.